I would lay the crossover first. That gives you a good anchor to radiate the rest of the layout from. With regards the signal box, you may wish to consider a platform based one, not at all unheard of in Scotland. Can anyone post a link to some cork for track bed purposes. Just want to compare the two types. Thanks. How about curves in cork? Do you just cut them out of a square sheet? What thickness and width are best for N? 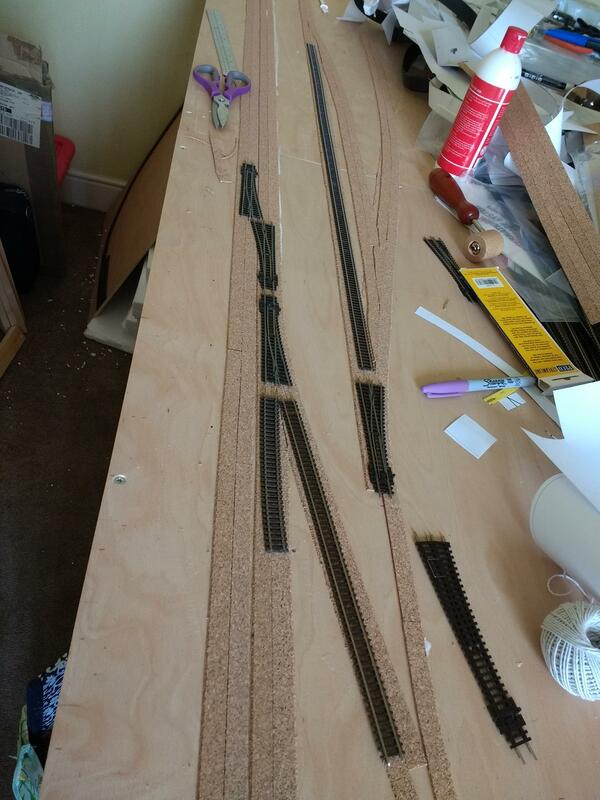 So I am all ready to start laying track. Does anyone else get nervous at this stage or is it just me? I am going to be using woodland scenic track bed, so my thought is to lay track bed first and then track. 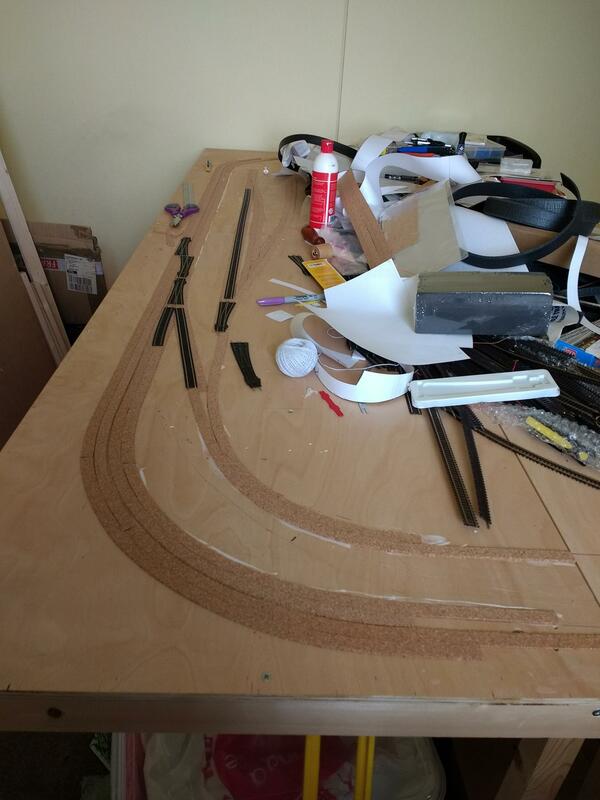 Any thoughts on if I should lay the curved track first or the straights? Any other tips/advice that might help me? Some way of fixing the track in place before ballasting. This could be track pins, map pins or screws - your choice. I tend to lay pointwork first and then move outwards from there. Thanks. How about curves in cork? Do you just cut them out of a square sheet? What thickness is best for N? It's been ages since I used cork but I believe the best way is to have the cork under the track in 2 x lengthways pieces as you can actually curve them providing the radius is not too tight. Thanks, local model shop had a couple of types of cork, went for the gaugemaster cork, the unballasted one. Looks ok and has fixed my spacing problem. Am driving myself nuts about track bed. In the pick below would I be right in just laying straight bits in the red box, but to curve the track bed in the yellow box? In the yellow box just run straights and then when you lay a straight piece for the siding or wherever that line goes, just cut the end diagonally so it meets the straight properly. If you're using sheet material then place rectangles of it under each point and trim away what you don't need. Have finally started laying some track bed. It seems to go down ok, just pva glue seems to work. Would I be right in thinking I need to leave a little more space between the rails on the curves? The tracks look a little close to me. Normal PW spacings should be about 25mm (from centre to centre) but with model railway curve radii, 30mm might be more appropriate on curves. Thanks, 26mm between the straight tracks, have measured the curves and 27mm, so will edge them away from each other to 30mm. Thought i would ask before laying track bed. Just a couple of pics of my progress re the track bed so far. If anyone sees anything wrong, please let me know. I have come across one minor glitch. 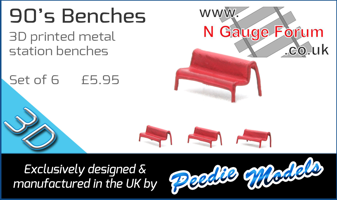 The space between my inner line and branch line is only 60mm. So rules out a few stations I like. I could put it on the outer line where I have 80mm. So question I have is can it be on either line, or is it practice to put the station on a specific side? 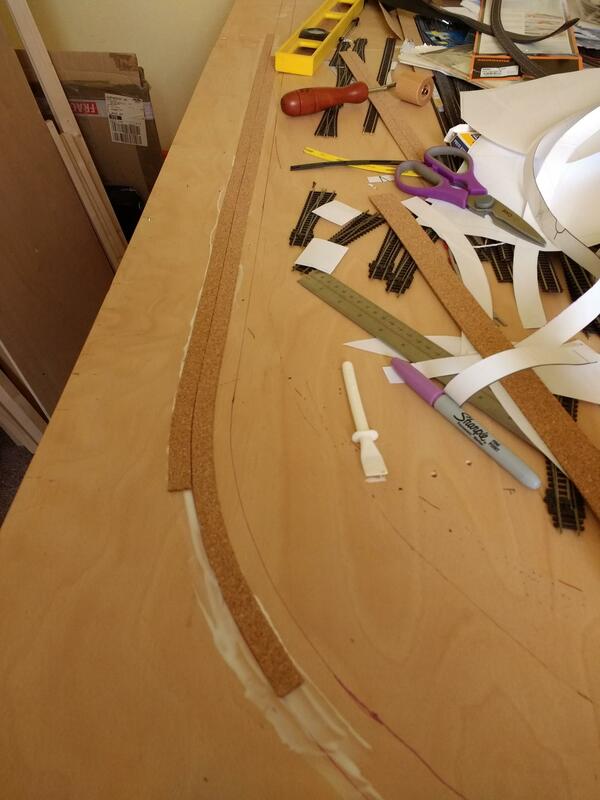 Hit a slight snag with trackbed as the cork underlay and woodland scenic stuff are different height, so ordered some rolls of cork and know all trackbed down in scenic and non scenic areas. Next step is track laying. On a side note picked up a box full of Railway Modellers from late 60's to mid 70's, all in very good condition. Will be good to look back at old layouts and maybe pick up a tip or two.